The TS-7800 is an ARM-based development development board from Technologic. It runs on 32-bit Marvell Orion 88F5182 ASIC with an ARM9 processor with 500 Mhz, 128MB DDR-RAM, and two integrated 2 SATA ports, 2 USB 2.0 480Mbit/s host/slave prots, and an RJ45 10/100/1000 Ethernet connector. The Marvell Orion 88F5182 ASIC is being used in a number of NAS appliances link, running this device with IP fabric services to USB, SATA, LVM is now up running with the LinuxIO and iSCSI. The TS-7800 series Single Board Computers (SBC's) run on a 500MHz ARM9 processor with power as low as 4 Watts. The TS-7800 SBC's are available in many configurations, most of which are Commercial Off The Shelf (COTS). 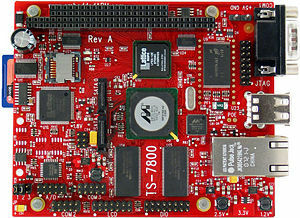 The TS-7800 is a Single Board Computer (SBC) based on a 500MHz Marvell 88F5182 ("Media Vault") ARM9 CPU. An internal 32-bit PCI bus provides a standard set of on-board peripherals such as 10/100/1000 Ethernet, dual SATA and dual high-speed Host/Device USB 2.0. The TS-7800 features 128MB of DDR-RAM and 512MB of high-speed NAND flash, and COM1/COM2 functionality. The TS-7800 SBC's run without fans or heat sinks in the temperature range of -20° to +70°C. The Marvell 88F5182 is specified to run 20°C higher than ambient temperature. Digital Signal Processing (DSP) is enabled through 5 channels of 10bit A/D converter, 110 DIO ports (86 of the 110 ports provided by the PC/104 header), and 12 standard serial ports. A Debian Sarge (3.1) based distribution can reside on TS-7800 Flash or the External SD. The default userspace does not ship with device-mapper or LVM tools, so they are provided below, as well as the raid1 kernel modules. Technologic Systems is an American company producing single board computers for embedded systems. They come with either x86 or ARM9 processors. The company states that the major advantage of its boards is very short boot time (less than one second). Some boards also have sleeping modes with very low power consumption (200 μA). These embedded computers run the Linux 2.6 kernel with a full Debian Linux distribution. Eclipse is available for some boards for developing embedded applications in C, C++ or Java. Most of the boards have USB and RJ45 Ethernet connectors, SD and other card slots, and some also have SATA ports. Technologic Systems also offers boards, enclosures and various ready to use "application kits", including configurations with Wireless LAN capabilities. This page was last modified on 29 September 2013, at 17:51.